Me and mum had a nice weekend. I had lots of sun puddles, naps, play time, foods and cuddles. Can't ask for much more. Now that we are getting way into spring the sun comes around the back of the house and gives me a wonderful spot to hang out in the sun in the afternoon. Or perhaps have a bit of a bath. Mum worked on her Derby slash Cinco de Mayo hat. The ribbon has the colors of the Mexican flag, a few roses (fake ones) and a play horse on top. Mum says it is not really looking like a race horse, but she couldn't find a race horse figure. Mum took a picture of her wearing her hat. Sort of clashes with the tie dye mum. I hope you have a less crazy top to wear with this. It is supposed to get really nice this week.Which means lots of open windows, mum can work in the garden as well. Happy week everyone. HiYa, Ducky here. Happy Caturday. It is starting out here super nice. We have lots of bright sunshine and it should be warm enuf for a slightly open window today. That means I will be doing my kitty yoga and stretches in the front window in the sunshine. No better place to hang out in the sun. I get all warms and I can keep an eye on mum while she does stuff. Mum has been bizzy this week. Lots of library stuff with helping at the book sale. She was so bizzy she didn't even have a chance to take a pic! Said Thursday AM was crazy as it was the opening day. She was only working for a few hours but they sold lots and lots. Mum went back to help in Friday afternoon, it was much quieter. Sale ends today, but she won't be working it or on the pack up of what is left. This was from last year, this year things were so much neater. 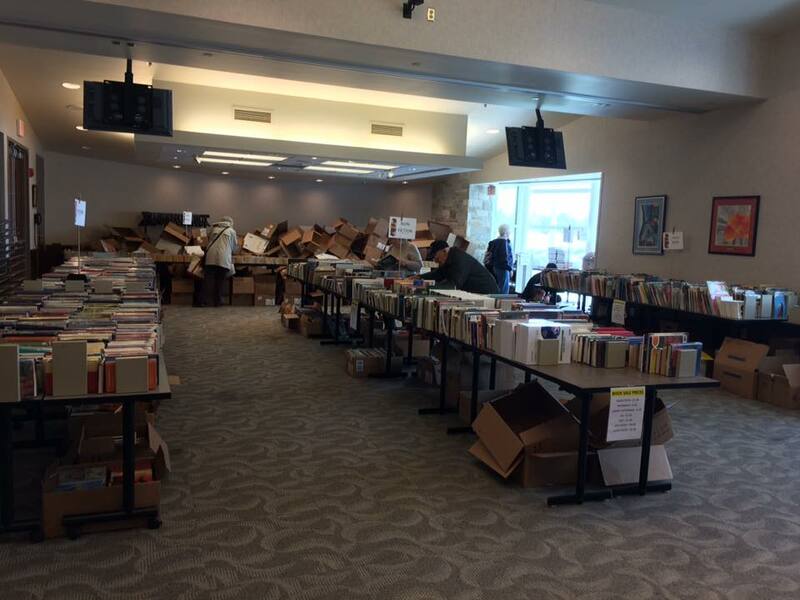 The excess boxes in the back were neatly stacked, few boxes sitting on the floor full of books too. Kids section off to the far right was much neater too. Mum says the librarian in charge said they did nearly $900 green papers worth of sales just on Thursday. 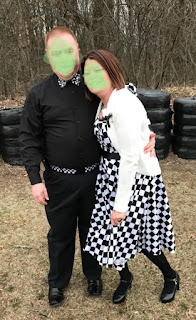 Mum found a pic of the wedding couple from last weekend so you can see her dress made from checkered flag material. She sort of smooshed out their faces. But you can see the tire wall on the outside of the track here. Mum even saw a short video of the end of the ceremony and she saw herself on it. So, not much else going on today. My plan is for lots of naps in the sun. Hope you have a good weekend and do the same. Hello from the garden from all four of us. Finally the weather is turning nicer. Our icky snow from last week has all melted in our yard. Mum says she see big piles of snow yet in parking lots, but we don't care about that. Our group shot in the nice sunshine on Wednesday. It feels so good to be outside in the warms and the sunshine. The daffs are finally blooming, the mini ones on top and the big size below. Color of flowers in our yard. Sort of hard to see but mum switched out some of the feeders. She hung out three hummer feeders. She read somewhere that having more than one feeder and having them close together actually helps attract more hummers. We shall see. Plus the oriole feeder is out with an orinch cut in half for them to eat. Hope things have improved at your house as well. We certainly are enjoying things here now that spring really decided to show up. OMC, I thinks spring is here and actually might hang around. It has been so nice that mum has even opened the big window that goes to the floor for a bit in the afternoon. I loves that as I can get my nap in and get fresh air too. So you can see me above, just a little bit ago, basking in the sun. Below, yeah, that is a woofie. That is one of the shop dogs where mum takes the grass eater for its tuneup. If the peoples have to move around, they have to step over him. They have a few other dogs around too, mum has stepped over and around them too. Mum has a special project to get together for her next racy weekend. A hat for Stinky Mayo Derby Day. So roses, a horse, red, green and white fevvers and ribbon too. Once mum gets it done, we will show it then. I hopes the nice weather has gotten to your houses too. I sure am enjoying my good weather. Mum abandoned me this weekend. Off to play with racy cars and she left already on Friday! Said for this early event they have to train new peoples, so they need an extra day. You just don't learn all there is to driving a racy car in one day. The driving is the easy part, it is knowing what to do when things don't go right. Mum said there was even a wedding on Caturday evening. Mum said the bride wore a dress that was made with checkered flag material. Mum did not have her flashy box with her during the ceremony to take a picture. If mum comes across a pic she will snag it for me. Mum found a real mallard duck at the track, this is the mister, the missus was around too, but mum didn'g get a picture. When she got home, this is the biggest pile of snow left in the yard. This is near the street and does get lots of sun. Plus we have snow left in the back. What was really cool mum got this envelope with green paper in it. I asked if this will be for me for treats and mum said NO! How dare she. She said this is for showing up and working. They randomly draw names and mum was one of three winners this weekend. So not what mum is back, I need to sit on her so she stays home with me for a bit. It continues to be bright and sunny, warmer and melty. I have doing some kitty yoga in the window and enjoying the sun. With the melty we are beginning to see Glimmer and Trooper again! Me and mum are going to chill, nap, read books and watch the snow melt. Umm, welcome to Garden Thursday? A garden full of snow! Starting on Caturday afternoon we started to get rain, freezing rain, sleet and then snow. We probably got about 6 inches of snow. Plus it was super windy. Cat down! The wind got Glimmer and then the snow started to bury her. Mum didn't rescue her, Glimmer did OK.
We got a bit of melting but not much. So Trooper at least had her head above the snow. Glimmer? Glimmer, at least we can begin to see her head and a couple of paws. This was early on Wednesday. Just after lunch on Wednesday, guess what? Yeah, it started to snow again. Soon Glimmer well she is going back under the cover of snow. Trooper getting covered as well. Mum had to go out for a meeting so when she got home she took one last picture for Wedneday. Can't see Glimmer at all again. Even Trooper is almost under! Me, I have better sense and have stayed inside like a smart cat. I watched the weather guessers and they say we are supposed to start finally getting melty weather starting today. Will be interesting to see how long it will take to make this all go away. Outside is still all white and they are saying more white stuff on Wednesday. We give up! We had a sunny day today, some melting. I want sun all the time and warm enough for open windows. Yeah, I don't like change. Especially when we finally get some sort of decent weather and it changes back to WINTER! We had some rain Friday and early Caturday, then just a bit of snow late Caturday. Then overnight it hit and kept snowing into the day of Sunday. Mum did clear off the drive as best she could, but lots of this is snow and ice stuck. Or super heavy to shovel. Mum says the sun can help it melt soonest. It was super windy too. Blew over the feeder holder and mum just left it down until Sunday when the wind was less. It even blew Glimmer over and she is buried in the snow. Mum found a picture of me on one of her flashy boxes, yes, she has more than one. We had sun that day and I was blisshed out by getting tummeh rubs. I want a wonderful sunny and warm day, actually I would like lots of sunny days. HiYa Ducky here. It is Caturday and mum and I are not going anywhere today. It is all icky out, cold, wet, rainy. Maybe we will also get freezing rain, sleet, snow before the weekend is out. Mum was going to take some old puter stuff to the electronic recycling drop off today. Nope she says, too likely to run into slippery driving. It can wait for another month when it is better. We did have good days on Wednesday and Thursday. Mum used the griller machine again and did some chick-hen. It was yummy. Mum ate one and the other is in the big cold box. So what will we do today. Nap, read and just hang out. Hope your weekend is better, or at least has nicer weather than we will. Hello and welcome to Garden Thursday. We finally got a nice day on Wednesday. It was nice enuf that I, Virginger went outside for a bit. I greeted those crazy kids who don't know enuf to come out of the snow, but they say they are just fine. No worse for the icky weather. I then joined mum while she cooked her sausages on the griller machine. She is trying to use up what stuff she had in the cold box before she goes to buy more stuff for the griller machine. The mum checked out the back and she looked and both of the feeders on the pole are gone. We saw sqwerls having a feast yesterday, so it didn't take them long to find the feeders and take advantage of them. Mum doesn't see that they hung them somewhere else. Finally in the back we are beginning to see the tulips and such start to poke their noses out. So if we get more warms we may get some flowers. Mum says today Thursday will be warmish, but then more cold weather. ICK. Take care everyone. See you next week. Another week is starting. Mum says this will be a quiet week, mostly her being home. That will be nice. That means sleeping in and naps in the afternoon. Mum watched a bit of what she called golf on the moving picture box. Men in bright colored clothes hitting a little white ball. Mum just likes to watch as she can see lots of purrty flowers. With our weather we don't have much in terms of purrty flowers. Plus you can see that we still have some snow left from the other day, plus the weather guessers are saying we might get a bit of snow today. Not as much as we had the last time but still, it is April and we want warms, enuf to have open windows. Mum says we have stupid naybors behind us. They attached some hangers to the electric pole, then hung some fevver feeders. Plus they put sqwerl baffles on them. Stupid as a sqwerl can easily climb up the pole and have a feast. These guys aren't too bright! Me, well, this was when me and mum were getting ready to have a nice bit of a nap yesterday. Guess we may end up here again today.